Use the Drop Box. 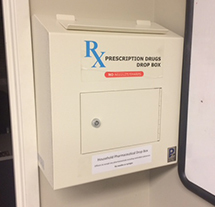 All of these agencies have installed “medication drop boxes” in which anyone can deposit discontinued, expired or unwanted medications, especially controlled substances. Rare. Greene County is one of the few counties in the State to offer five sites. The boxes were purchased by the Greene County Rural Health Network. First …Safeguard your medications… Second … dispose of the ones that are no longer needed or outdated. No Questions asked and No Paperwork required. Just put your medications in these boxes, including prescription narcotics. 9 AM – 5 PM, Monday through Friday. Located at the Sheriff’s Office in Catskill. Just go in the front door and you’ll see the box. 943-3300.Coxsackie: 8 AM – Midnight, Sunday – Saturday. Located at the Police Department in Village Hall. 731-8121. Durham: Durham Police Dept, 7309 NY Route 81, East Durham. 239-6310. Windham: 9 AM – 3 PM, everyday. Located at the Police Department in Hensonville. Call and set up a time to ensure that the Officer will be in the office. If the Officer is on patrol or on an assignment, access to the drop box will not be available until the Officer returns. 734-3151. Rising Abuse. Prescription drug abuse has increased and even surpassed the use of most illicit drugs. Overdoses have taken lives. Adults, Teens and Kids. Adults, teens and even kids at younger ages abuse drugs. Many teens consider prescription and over-the-counter medications as party drugs. Parents are not aware that their own medicine cabinets are often the sources of these drugs. Private Households only. The drop boxes are for private households only. They are not intended for use by pharmacies or veterinarians. Please do NOT use the boxes for … syringes, IV bags, bloody or infectious waste, inhalers, soaps and shampoos, empty containers, or trash. Environmentally Safe. The medications will be properly incinerated at a licensed facility. People should not flush unused drugs because that pollutes the water supply and throwing them into the garbage makes it an easy target for thieves and pets.